Ignaz Pleyel, composer, music publisher and piano manufacturer, was born on June 18, 1757 in Ruppersthal, Austria and died on November 14, 1831 in Paris, France. He composed a great variety of music, more than 40 Symphonies, a very large number of String Quintets and Quartets, 8 Flute Quartets (for Flute, Violin, Viola and Cello), numerous Trios and Duos for a variety of instruments. Rita Benton (born 1918) published Ignace Pleyel. A Thematic Catalogue of His Compositions (1977) which assigns each of Pleyel’s works a B(enton) number. Many of his compositions, including his concertos, were often for several alternate instruments. Clarinet Concerto No. 1 (B106), composed in 1797, originally in C Major, was for Solo Clarinet (in C) or Flute or Cello; Concerto in D Major (B105), composed in 1790, was for Solo Viola or Cello; and Clarinet Concerto No. 2 (B104), composed in 1788-9, originally in C Major, was for Solo Cello. During the French Revolution (1789), he moved to London; this was the same period when Franz Joseph Haydn (1732-1809), his former teacher, was also giving concerts in London. When he returned to France in 1792, he immediately composed a pro-Revolutionary hymn La revolution du 10 août 1792 ou Le tocsin allégorique (The Revolution of August 10, 1792, or The Allegorical Alarm), to remain in the good graces of the revolutionary authorities. The somewhat reversed designations of Concerto No. 1 (for B106) & Concerto No. 2 (for B104), is to conform with the designations used in the 2008 recording by Dieter Klocker. A very good 1993 recording by Paul Meyer makes no such distinction, mainly because B106 is performed in the original key of C Major (on C Clarinet?). 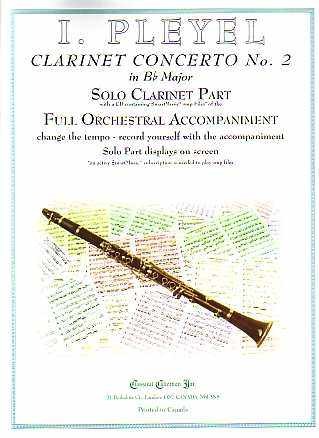 Clarinet Concerto No. 2 (B104), originally in C Major for Solo Cello, has been transposed down a tone for standard Bb Clarinet.